An English teacher (and director of inclusion) discusses how best to get those who don’t want to read to become motivated and successful readers. She draws an analogy with her own efforts at a cycle spinning class. Today it was announced that the government will fund the “Claim Your College” coalition of vested interests and their scheme to create a professional body for teachers that’s actually open to “anyone with an interest in education”. It is expected that the new college of teaching might take on greater responsibility for areas such as professional standards and continuous professional development, should it so wish, thus moving stewardship of the profession out of the hands of the government and to the profession. So that’s not just money, but also power over our professional development, in the hands of a body that has no mandate from the profession, only one from vested interests including (as I pointed out here) at least one private company selling professional development training. …we need an element of trust. To reject an affliction which seems to bedevil Westminster culture. I call it the cult of the big reformer. A sort of alpha male compulsion to see public policy through the prism of your ‘reforming legacy’. But you only have to see how social media has sent a shockwave through the teaching profession and its conversation about a new College of Teaching, to see how profoundly out of date this attitude really is. … the days of education by diktat must come to an end. More than ever before change in education must come from the bottom-up. Through decentralisation. Through devolving power. Yes, that’s right. He thinks that chucking money at vested interests to regulate, sorry, to assume stewardship of the teaching profession is decentralisation. If he’d actually read the conversations on social media about the College Of Teaching, he’d know how few of those involved are actually teaching now and how little say those of us in the classroom have had. But I don’t think anybody here would argue with me if I suggested we have only just begun to scratch the surface of what we could achieve. 3D printing; Augmented reality; Coding; Robotics; Big data; Interactive textbooks; Adaptive learning software; The technology is truly remarkable. So whilst I know it has been prematurely prophesied many times before, I do believe this is finally the moment when technology changes the way teachers carry out their craft. We will see schools where every lesson can be simultaneously tailored to the needs of each individual pupil; schools where data about the effectiveness of different pedagogies can be shared with teachers in real time; and schools where software has liberated teachers from the yoke of marking exercise books. Between government ministers unable to tell the difference between the teaching profession and the CPD industry, and an opposition spokesman sounding like Shift Happens, this is a grim day for the politics of education. Perhaps my memory is playing tricks on me, but I don’t remember even Ed Balls being this hopeless, and the Gove era is a much-missed golden age compared with this shambles. Last year, when we decided that we wished to step down as editors of Labour Teachers, we were keen that the site should continue: as a discussion space for Labour-supporting teachers (and those who want to talk to them) that operated without policy motions and activist-centred conferences, we believed and continue to believe the site has something to offer to the process of debating education within the Labour Party and amongst teachers. In an age in which social media has become increasingly important in the wider political discussion of schools policy, Labour Teachers retains significant potential to build support for Labour amongst educators as well as challenging and shaping the consensus on education within the party. For that reason, we are delighted to say that prominent education blogger Old Andrew has agreed to take on the mantle of Editor of Labour Teachers. Andrew has a long pedigree in education blogging: his Scenes From The Battleground is required reading for anyone interested in the education debate, from the Secretary of State on down. He is a powerful and passionate advocate for traditional ideas of teaching in education, but has always made clear his commitment is drawn from his own left-wing beliefs. As a member of the Labour Party and the NUT, Andrew is well-placed to share and examine ideas for education emanating from the labour movement. But more than just sharing his own ideas, Andrew has shown a consistent commitment to amplifying the voice of other teachers on social media (including many with whom he has crossed Tweeted swords) via the Education Echo Chamber blog (and it’s even more comprehensive “Uncut” sibling) and his creation and curation of the most definitive lists of UK education bloggers available. Andrew has also written for Schools Week, highlighting excellent education blogging. As we have always been, Andrew is committed to offering a platform to the diversity of views on education, and under his editorship, Labour Teachers will continue to seek out differing perspectives from the chalkface amongst Labour supporters. We will both continue to be involved with Labour Teachers, writing and helping out in other ways, but as we approach what may be a defining election for Labour, now is an excellent time for a new editor to take charge. Andrew’s combination of firm Labour values, well-considered policy positions and desire for intense but open debate makes him the ideal person to take Labour Teachers forward, and we both wish him well. I’ll give more details on the Labour Teachers website as soon as I get a moment, but my plan is to organise regular blogging, at least a couple of posts a week, on the Labour Teachers blog from the start of April. However, first I need to recruit a range of teacher bloggers who are either Labour Party members or Labour supporters. I’m not planning to push an editorial line, I want a range of views and lots of debate. Anything on policy, Labour or being a teacher is fine. If you are interested, please email me using the “Contact Me” details on the sidebar of this blog or on Twitter @oldandrewuk. Happy to hear from both experienced bloggers (who are Labour members) wanting a regular slot (every month or every two months) and from new bloggers, or people who are Labour supporters, wanting to write something on a one-off basis. Thanks to John & John for the work they’ve done and for giving me this opportunity. Mr Laws [the schools minister] said funding for a Royal College of Teaching would be announced before the election, to put teaching on an equal footing with professions such as law and medicine. “This has the potential to finally give the teaching profession the recognition, respect and high status it deserves,” he said. It has always been a likely prospect that clueless, but publicity-hungry, politicians would be making announcements about this in the run up to the election, although there is some irony that that plans to subsidise the education establishment were announced in an article claiming that Michael Gove still had lots of influence over education policy. I’ve argued repeatedly against the latest plans for a College of Teaching, largely on the basis that they are plans for a body that non-teachers can join which would, nevertheless, seek to speak for or even regulate, the profession. The latest plans seem to have been built around the idea that any group currently involved in CPD, including trade unions and at least one private company, should be involved in the initial structure, and that any recognition of current practising teachers should be put off for at least 4 years and only apply to some subsection of teachers approved by those setting the organisation up. There are several reasons such an organisation cannot be trusted to spend money intended for the professional development of teachers. 1) The College of Teaching needs to be free to argue for, and organise, changes in how professional development for teachers is provided even if that does not fit the agenda of those already involved in the CPD industry. That cannot happen if the organisation is full of appointees of current vested interests. The involvement of SSAT, a private company providing CPD, is particularly suspect. Imagine if a pharmaceutical company had set up the Royal Society of Medicine. This is not an independent body. 2) The College of Teaching needs to be able to speak for those actually teaching in schools and colleges. It is that lack of power and a voice from the frontline that has deprofessionalised us. If the membership is dominated by educationalists, consultants and non-teaching headteachers it will do the exact opposite of what it is meant to do. It will reinforce our powerlessness. 3) The model of professional development being put forward is one that, I believe, many teachers will object to. It is currently being suggested that teachers be assessed and classified as associates, chartered members, or fellows. This is the old model, where teachers were considered experts depending on where their game playing had got them, i.e their position as managers, ASTs, or even as “outstanding/good/requires improvement/inadequate” teachers based on their latest appraisal. This is not what teacher expertise looks like. We should be recognised for our different types of expertise in different areas, not ranked. The only teachers who would join an organisation dedicated to saying that one teacher is a better teacher than another, are those who think they are better than their peers, or who are chasing promotions or other opportunities to teach less. It will have no appeal to those who actually just want to get better at teaching. And this problem would have been utterly obvious if the movement to set up a College Of Teaching had been teacher-led, not led by vested interests. Of course, without public subsidy or a means to coerce teachers to join, this organisation will get nowhere in its present form. But if politicians are looking for the appearance of supporting teachers without any of the substance, they are going to throw money at this. So let’s be ready to say loudly and publicly that money paid to the proposed College Of Teaching is money spent undermining, not supporting, the teaching profession. Let politicians know they will face difficult questions if they throw public money at this proposed quango and then claim they are doing something for teachers. If you follow me on Twitter you may have already seen it, but this will be an introduction for many readers. I have set up a new website, Echo Chamber Uncut. This is a companion site to The Echo Chamber where my team of volunteers and I have been blogging links to the best blogposts we could find. Discovering blog posts you weren’t familiar with. A short time browsing through the posts is likely to give you a chance to find plenty of content you weren’t familiar with. You can also watch out for new posts by following @EchoChamberUncu on Twitter. Searching for blogs on a particular topic. While it is uncategorised and only has a basic WordPress search, that should be enough to find posts related to any keyword you search for. As it builds up it will be a good way to find out what the denizens of the blogosphere are saying about any given topic, whether that’s an issue in school, a news story or advice about something to do with teaching. Finding blogs to follow. Browsing the posts should give you a chance to look out for writers you weren’t familiar with and it also has a Blog Roll (which I will update from time to time) listing all the UK education blogs I know of (more than 1200 of them). So please, take time to have a look. 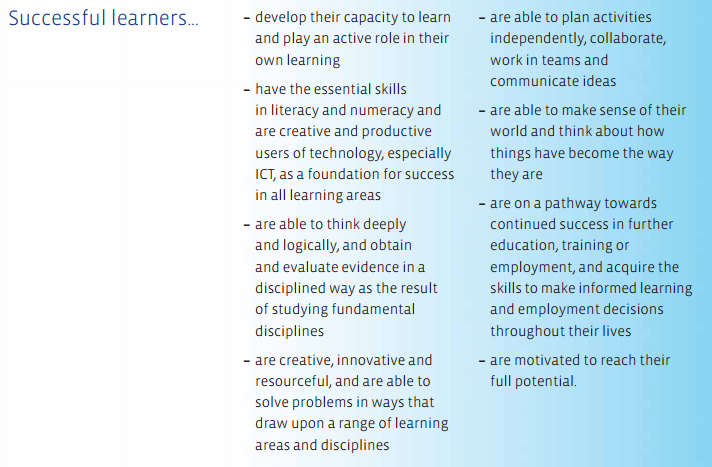 There is also a longer breakdown of these ideas, listed under the heading “Purposes of the Curriculum”. likely to have cost more than a couple of quid to put together. Our aspiration for all children and for every young person is that they should be successful learners, confident individuals, responsible citizens and effective contributors to society and at work. 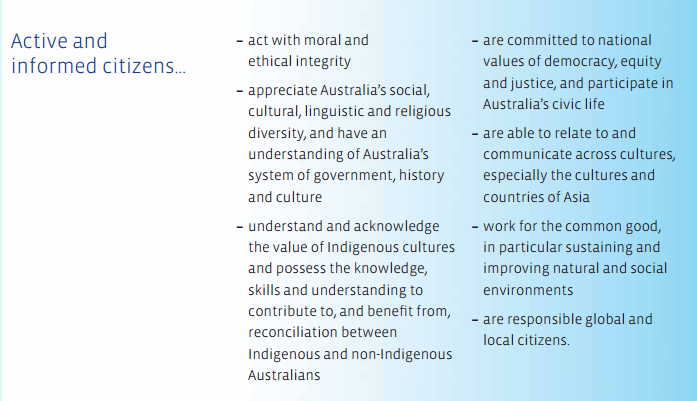 And just, in case you thought this sort of thing was only found in the British Isles, here is the Australian version, from the Melbourne Declaration of Educational Goals, made by all Australian education ministers in 2008. I have commented on the English version before (here and here) but I will summarise the problems here. 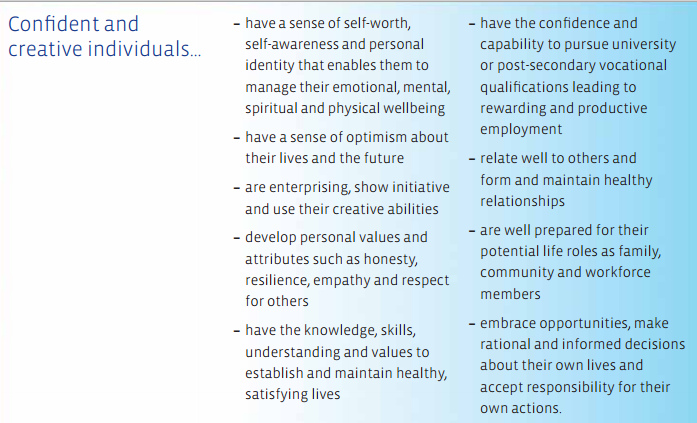 There are far too many aims, particularly if you break them down. As a result nobody could ever use it to make decisions. Almost any option would be covered by something. Inevitably, no school could directly implement these principles as written, and it is left open to a multitude of “experts” to interpret them. Most of the aims fail to reflect that the primary purpose of education is academic. They are about attitudes, opinions and feelings not about learning. The one academic category, i.e. “successful learners” contains more items about how students should learn and their attitude to learning than about what is learnt. A lot of this is vacuous or circular jargon. For instance, being “successful” isn’t an aim, you can only succeed if you already have an aim. …CfE (in respect of those core principles) retains all-party support in parliament. Furthermore, our research, and my recent professional interactions with teachers suggest that the teaching profession remains largely in support of those same core principles. core knowledge around which teachers can develop exciting and stimulating lessons to promote the development of pupils’ knowledge, understanding and skills as part of the wider school curriculum. Not perfect, but a direct endorsement of the academic purpose of education. In my view, it is official permission to teach. To be fair to the Welsh government, there is some new stuff about knowledge in their curriculum aims which suggests some attention has been paid to how the debate has moved on, but their “independent review” clearly was not independent enough. The same stuff has been recycled yet again, and I doubt any of the cut-and-paste merchants were working for free. The TES awards now have an award for “Blogger Of The Year”. The voting is all done by a panel of judges, so don’t worry, I’m not begging for support. Any practising teacher who blogs (please remember this, don’t waste time nominating those who are who not eligible) could be nominated and I’m trying to ensure that all the best blogs are put forward for consideration. Fortunately, you can nominate yourself, and I’m led to believe this won’t count against you. However, there is a real risk that some great blogs could be missed, so please, please help with nominating. The deadline is tomorrow at midnight, Sunday 8th March, so time is short. Finally, if you write a blog but I haven’t mentioned you above, please don’t take it personally, I have probably just assumed that you can get yourself nominated without my help. If you are having difficulties, please ask for help in the comments below and I’ll see what I can do. 2) Battle Of Ideas Panel discussion. You are currently browsing the Scenes From The Battleground blog archives for March, 2015.